Chemtrails & Corporate Weather Wars ... The "Disaster Capitalists"
.... "Dry Thunderstorms, Lightning & Fires"
When one of the five journalists who interviewed him complained about federal investigators arriving to search the home of a witness in an inquiry early in the morning, Mr Medvedev told the journalist not to worry and then stepped out of camera range. But his microphone was still switched on when he followed up with: "They are just jerks, so they come at eight in the morning. It's just their set of habits. I know many people who work in the police. They think if they come at seven in the morning they will get everything in the world." "Along with the briefcase with nuclear codes, the president of the country is given a special 'top secret' folder. This folder in its entirety contains information about aliens who visited our planet," Mr Medvedev answered. "Along with this, you are given a report of the absolutely secret special service that exercises control over aliens on the territory of our country ... More detailed information on this topic you can get from a well-known movie called 'Men In Black' ... I will not tell you how many of them are among us because it may cause panic,". None of the television stations that interviewed Mr Medvedev broadcast the off-air comments, but they were delivered to Reuters as a pool signal and some were shown on YouTube. Asked whether he believed the world would end on Dec. 21 under a New Age prophecy, he said no. Asked whether he believed in Father Frost (Santa Claus): "I believe in Father Frost. But not too deeply. But anyway, you know, I'm not one of those people who are able to tell the kids that Father Frost does not exist,"
Just A Reminder: The Mayan Calendar says that the meaning of the December 21st-23rd is meant as a fiscal indicator for the coming year (2013+) and indicates "Destruction by Earthquakes" as well as "a return of the gods". Pyramids in Egypt, the Himalayas, England, Mexico, Sevastopol, Easter island, and Bermuda are divided into 2 groups; each oriented to a star in Northern hemisphere. One group serves as the energy receiver, and another as its transmitter to the selected Star. These stars are located at an angle of 120º (trine) in relation to each other... they create electromagnetic nodes or focal points that seem to be (among other things) influencing the earth’s axis location (angle) & thus the motion (rotation) of the Earth. The materials used for building these constructions can resonate well: for example, copper oxide and aluminum oxide mixed with clay can form an excellent semiconductor which can transform energy on levels of frequency. The materials used are similiar to those used in Egyptian Pyramids. How'd All This Get Started? All Crimean pyramids are completely covered by land (or the sea). A group of geologists, led by Candidate of Technical Science,assistant professor Vitaly Anatolevich Gohom, established the presence of thermal waters. They were also searching for vantage ground for water well drilling near Sevastopol.... when they came across a source of super-high-frequency radiation localised near the Earth's surface. The receiver recorded ultra-high frequency-a field with a radius of 100 metres. The source apeared to be a pyramid with a height of 45 metres, and a bottom length with a side of 72 metres long.. Its dimensions formed a ratio of 1:1,6, which corresponds to “gold section” ratio of the Great Pyramid of Giza. 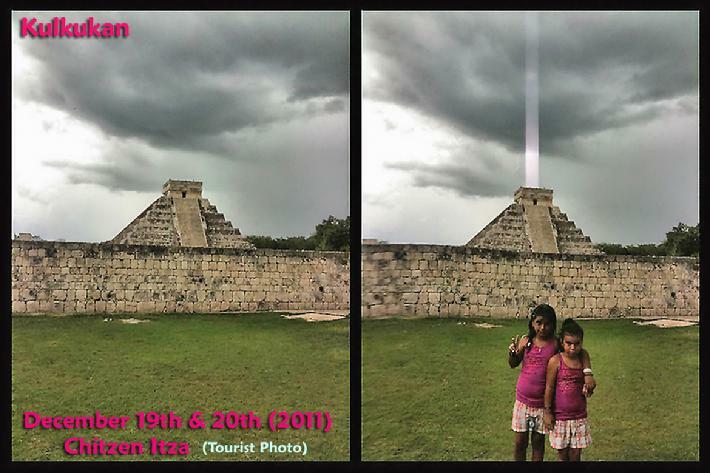 Underground Beam Emitting Pyramids - - ... IN CRIMEA, no less ... wouldn't you just know it? The Crimean Pyramid has been dated to the Jurassic Age time period.... 201.3 – 145 million years ago; when the earth was full of dinosaurs. On a piece of the South coast of Crimea from Sevastopol to Forosare (from the northwest to the southeast) is a line of seven pyramids, which have the same age as Tibetan pyramids. If that line is extended across the globe; In one direction lies Stonehenge, and; in opposite direction, the Tibetan pyramids... then further on are found the sunken pyramids of Easter island. The Crimean pyramids count is already at 37 megalithic constructions. 28 form a huge rhombus: (1) Sevastopol is the point in the sea to the west from Simeiz- Yalta – Konerchino village of Bakhchisaray Raion). (2) In the middle of this rhombus in Krasniy Mak village the 29th, central 56-metre pyramid is located. (3) Seven more pyramids form a small internal additional rhombus around Yalta where the centre the 37th pyramid is located. Crimean pyramid” has a truncated top, like a Mayan pyramid, but its appearance is more like an Egyptian. “Under the foundation is a small body in the form of a mummy long 1.3-1.4 meters with a crown on his head. “There is a resonance chamber of so-called Sphinx. The pyramids were built in the era of the dinosaurs,” says a scientist in an interview with ICTV. It remains unknown who build the pyramid. The unique building is the oldest on the planet, says Vitalii Goh. ("Before It's News" Author’s Note): Crimea is also where Einstein’s theory of special relativity was set to be proven by photographing star-light bending around the sun during a solar eclipse at the outset of WWII. "Seven long strides thou shalt take, says she. And if Long Compton thou CANST see, King of England thou shalt be!" The king became the solitary King Stone, while nearby his soldiers formed a cromlech, or circle, called the King's Men. As the witch prepared to turn herself into an elder tree, she backtracked into four of the king's knights, who had lagged behind and were whispering plots against the king. She turned them to stone as well, and today they are called the Whispering Knights. Legend holds that as the church clock strikes midnight, the King Stone comes alive and the king and his men come to life on certain saints' days. According to 18th-century lore, village maids would sneak out to the Whispering Knights on Midsummer's Eve and listen carefully, hoping to be whispered their future and fate. It is said that one cannot accurately count the stones and that a different tally will result each time an attempt is made. The King Stone was fenced off between the two World Wars to prevent conscripted troops chipping off a piece of stone to carry with them, since legend suggested that this would give protection in battle. But it is considered unlucky to touch the King's Men. Location: 51° N 58' 04" / 01° W 34' 45"
Just before dawn, in late October of 1978, a research chemist named Don Robins applied a broad spectrum ultrasonic detector to the Rollright Stones in Osfordshire, England. The equipment registered a rapid pulse emanating from the the King Stone. Over the next four years; tests were also conducted on other megalithic structures throughout Great Britain. Tests were conducted to rule out weather conditions, other natural structures & time of day. Dawn was the time of the pulse ... which transformed into an actual howling sound, lasting for several hours on the mornings of the spring and autumn equinoxes.Stranger still ... the megalithic stone circles generated a higher than normal radiation reading on the outside; and a "no radiation" reading on the inside of the circles. Engineer Charles Brooker used a portable magnetometer which showed a 7-ring spiral of diminishing magnetic intensity .... indicating the Rollrights circle was essentially "screening out" electromagnetic radiation to create a "no-radiation zone" within the circle itself. ADDENDUM: Spelt (an ancient form of Wheat) has the interesting attribute of being resistant to .... Radiation. Spelt was a main source of grain in Europe from the Bronze Age to medieval times. It is a hybrid of emmer wheat & wild goat grass; perhaps as late as 8000 years ago. The Popul Vuh, reputedly the oldest historical text of the ancient Maya, describes the destructive effects (unfortunately quite recognizable to us after Hiroshima) of a fire from the sky that put out eyes and decomposed flesh and entrails. Great cities to the north (i.e., in the territory of what is today the U.S.A.) were destroyed. Canadian Indians speak of "men who flew upon the skies" and had shining cities and grand homes "to the south" (i.e., in what is today the U.S.A.). Then an enemy nation came "and there was terrible destruction. All life in the cities was gone—nothing but silence remained." Hopi Indians recount that "some of these of the Third World" (i.e. inhabitants from the previous Third World) flew to a great city, attacked it and returned so quickly that the inhabitants did not know where their attackers came from. Soon many nations flew to attack one another. "So corruption and destruction came." In the western United States, ruins exist in southern California, Colorado, Arizona and Nevada, in which exposure to some source of radiated heat was so intense, it liquified the rock surface. In 1850, Ives Walker was the first to view some of the Death Valley ruins; where he discovered a city about a mile long, with the lines of streets and the positions of buildings still visible. At the centre he found a huge rock, 20 to 30 feet high, with the remains of an enormous structure atop it. The south side of both rock and building was melted and vitrified. Recently reported: "The whole region between the Gila and San Juan Rivers, is covered with remains. The ruins of cities . . .which must be most extensive, and they are burnt out and vitrified in part, full of fused stones and craters caused by fires which were hot enough to liquify rock or metal. There are paving stones and houses torn with monstrous cracks." It is not known who the inhabitants were. We would place the most likely time for these cities’ destruction to be in the period 2000 to 1000 BC. A heavy layer of radioactive ash in Rajasthan, India, covers a three-square mile area, ten miles west of Jodhpur. Scientists have unearthed an ancient city where evidence shows an atomic blast dating back thousands of years, from 8,000 to 12,000 years, destroyed most of the buildings and probably a half-million people. One researcher estimates that the nuclear bomb used was about the size of the ones dropped on Japan in 1945. The Mahabharata clearly describes a catastrophic blast that rocked the continent. : "A single projectile charged with all the power in the Universe…An incandescent column of smoke and flame as bright as 10,000 suns, rose in all its splendor…it was an unknown weapon, an iron thunderbolt, a gigantic messenger of death which reduced to ashes an entire race. "The corpses were so burned as to be unrecognizable. Their hair and nails fell out, pottery broke without any apparent cause, and the birds turned white. "After a few hours, all foodstuffs were infected. To escape from this fire, the soldiers threw themselves into the river. "Instead of mushroom clouds, the writer describes a perpendicular explosion with its billowing smoke clouds as consecutive openings of giant parasols. There are comments about the contamination of food and people's hair falling out." "Iron roads will be built, and iron monsters will bark through the wilderness. Cars without horses and shaft will come, and men will fly though the air like birds." "When in the outskirts of the forest the iron road will be finished, and there the iron horse will be seen, a war will begin, to last for twice two years. It will be fought with iron fortresses that move without horses, and with powers that come from the earth and fall from the sky." "Right after this horrible war there will come a time when money will have no value. For 200 guilders not even a loaf of bread will be available, and yet there shall be no famine. Money will be made of iron, and gold shall become so valuable that for a few gold coins a small farm can be bought." "Two or three decades after the first great war will come a second, still greater war. Almost all nations of the world will be involved. Millions of men will die, without being soldiers. Fire will fall from the sky and many great cites will be destroyed." "And after the second great struggle between the nations will come a third universal conflagration, which will determine everything. There will be entirely new weapons. In one day more men will die than in all previous wars combined. Battles will be fought with artificial weapons. Gigantic catastrophes will occur. With open eyes will the nations of the Earth enter into these catastrophes. They shall not be aware of what is happening, and those who will know and tell, will be silenced. Everything will become different than before, and in many places the Earth will be a great cemetery. The third great war will be the end of many nations." Around September 17, 2012; radiation spiked high in a number of US cities, but especially the Pacific Northwest. Pacific Northwest areas were the hardest hit by Fukushima fallout the first time around; as the jet stream usually makes a beeline for them. Then, instead of going "back to normal"; radiation continues to spread East and South across the United States. "In February 1960 the US detected an unknown object in polar orbit, a feat that neither they nor the USSR had been able to accomplish. As if that wasn't enough, it apparently was several sizes larger than anything either country would have been able to get off the ground. HAM operators began to receive strange coded messages. One person in particular said he managed to decode one of the transmissions, and it corresponded to a star chart. A star chart which would have been plotted from earth 13,000 years ago, and focused on the Epsilon Bostes star system. On September 3, 1960, seven months after the satellite was first detected by radar, a tracking camera at Grumman Aircraft Corporation's Long Island factory took a photograph of it. People on the ground had been occasionally seeing it for about two weeks at that point. Viewers would make it out as a red glowing object moving in an east-to-west orbit. Most satellites of the time moved from west-to-east. It's speed was also about three times normal. A committee was formed to examine it, but nothing more was ever made public. Upstream, Downstream ... Which "Stream"? 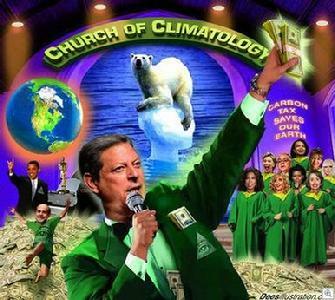 The JetStream...One Agenda - Drought & Land Grabs? Now we've got "Weather Money Market Derivatives": "The Weather Event HAS To Be Severe" - "Guess Who Loses"? Alternating flooding conditions & drought conditions; equals diminshed crop production, and/or poor crop production. HI! We're "Disaster Capitalists" ... and We're Here To Help! It's not "you" ... it's the "Military Industrial Complex" ... funded by taxpayer dollars. 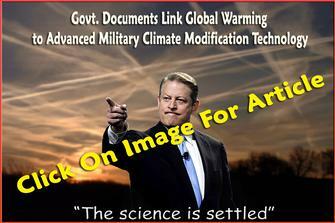 The military has been actively engaged in Climate Warming Weapons Technologies for more than 20 years. Jules Verne wrote about geoengineering the earth’s climate in 1889 in a sequel to “From the Earth to the Moon” called “The Purchase Of The North Pole”.